many Ukrainian dating readers are wondering if Ukrainian is a dialect of the Russian language. I wrote in my article “Language situation and language policy in contemporary Ukraine” that the language issue in modern Ukraine is very complex and is not easy to describe. But you have to remember that Ukrainian is Not Russian and Russian is Not Ukrainian. They are two separate languages (although I have to say that these languages ​​are very similar). To many outsiders, Ukrainians are almost the same as those that are from Russia including their languages. Although this does not come as a complete shock for both the Russians and Ukrainians, they believe there is a clear difference between them just like differentiating Thai and Chinese food. The truth is that the languages of the two nations are actually quite similar (as said above already) because both come from Slavic roots. However, they are considered two dissimilar languages and definitely not two different dialects of one language. Culturally, the two countries are Slavic and almost all of the people in the eastern part of Ukraine use the Russian language. Both originated from one ancestor though which is Proto-Eastern Slavic. Later on, they branched out from their predecessor 1,500 years ago. I would like to explain the graph now. Unfortunately, I did not find the graph on the use of Russian and Ukrainian in English.The graph gives you a picture of the language situation in Ukraine. Dark green covers the territory of Ukraine (mostly Eastern Ukraine) where Russian is spoken almost exclusively. In Eastern Ukraine, you never hear the Ukrainian language. In the villages, the people can speak surzhyk, but the Russian language still dominates in the conversation. 46% of Ukrainians speak Russian in the areas shaded in light green (mainly in central and east-northern part of Ukraine). 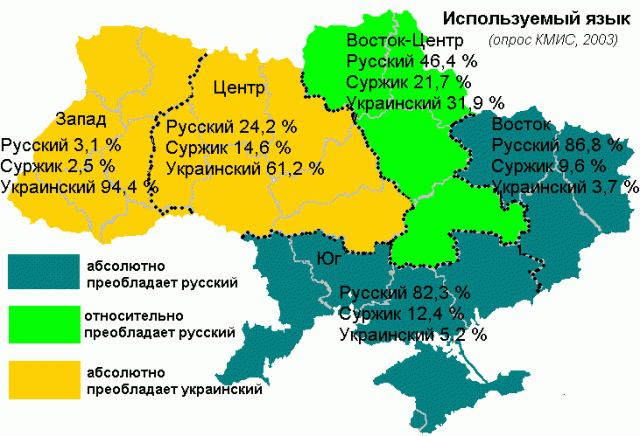 31% of Ukrainians speak Ukrainian and 27% speak surzhyk in the areas shaded in yellow (Western and Central Ukraine). You are wondering what surzhyk means? Surzhyk (Ukrainian: суржик) refers to a range of russified sociolects of Ukrainian used in certain regions of Ukraine and adjacent lands. It does not possess any unifying set of characteristics; the term is used for “norm-breaking, non-obedience to or nonawareness of the rules of the Ukrainian and Russian standard languages“. In Soviet times the usage of Ukrainian was gradually decreasing, particularly at times when the policies of Russification intensified (1930s and late 1970s to early 1980s) and thus a sizable portion of ethnic Ukrainians have a better knowledge of formal Russian than of formal Ukrainian. Since 1991, however, Ukrainian has become the official language of Ukraine. Ukrainian is the principal language of the residents of the country and about 45 million native speakers worldwide. When written, the script comes from a modified form of the Cyrillic alphabet writing system. The Ukrainian language is believed to have come from Indo-European language family where Balto-Slavic, Slavic, and East Slavic all stemmed from. Ukrainian and Russian have a high level of mutual intelligibility, which means that the speakers readily understand one another without the need for extraordinary effort. Although Ukrainian is the official language of Ukraine, Russian is actually spoken by many people here including those that live in major cities in both eastern and central Ukraine. Nevertheless, Russian is considered a minority language in the country. Russian is spoken in Russia and in other countries like Kazakhstan and Belarus. This is considered the most prevalent language of Eurasia geographically and is currently the most extensively spoken out of all Slavic languages. This is due to the fact that there are almost 145 million native speakers in many countries around the world which makes it the 8th most spoken language today. Fortunately, there is not much resentment as many speakers in Ukraine (NOT in Russia) combine the two languages. Antagonism only occurs among those that speak only one of the languages because they feel alienated when they are with people that speak the other. Most part of Ukraine however is bilingual especially those that have been traveling a lot and those that are well educated. Two people commonly converse using the two languages and they may not even realize that this is happening. Street vendors, farmers, and laborers on the other hand also speak a mixture of Russian and Ukraine with one of the two being more dominant than the other. This combination is known as Surzhik or Surzhyk. The Russian language which is spoken by those that live in Ukraine is almost very identical. However, there are a few minor dissimilarities particularly in pronunciation. The most noticeable difference is the “g” sound which is often pronounced by Ukrainians as “h” which many native Russians make fun of. Apart from that, there are also differences in the style or manner of speaking and in the intonation as well. For those that are fluent in the Russian language, passive exposure for several months is often enough to understand or grasp the Ukrainian language. This is also true for native Ukrainian speakers. Westerners on the other hand usually have an easier time in comprehending Ukrainian because this language has fewer soft or palatized consonants including t’, l’, r’, and s’. There are also fewer difficult clusters of consonants such as vstv and str. For the most part, Ukrainian and Russian pretty much share their vocabulary. Most of the time, the only difference is the pronunciation paradigms. For most foreigners, there is not much difference between the two languages. As a matter of fact, many would think that they are the same language during the first few times of listening to them. The dissimilarities are comparable to the Canadian characteristics which may be similar to the Americans’ except for few distinct qualities. The Ukrainian language actually sounds gentler and is more poetic and musical than Russian.